At Newman Family Dentistry, we provide dental services to people of all ages. This includes children, teens, and adults. We understand that children and teens have different dental health needs than adults. It is important to provide an environment where they can feel at ease and listened to. Our staff are experienced in working with young children as well as teenagers. We provide a comfortable, family dentistry environment. Our staff also make sure to listen to each and every one of our patients. We will talk to parents and work with them to ensure their children have healthy oral hygiene routines. We will also work with children and parents to individualize a dental hygiene plan. At Newman Family Dentistry, we know that every child is different, and we are focused on providing individualized care. As a family dentist in Indianapolis and Carmel, we provide a variety of services including x-rays, check-ups, fillings, and much more. The summertime is always busy and full of vacations, activities, and fun in the sun. It can also be hard to focus on routine in the summer. This is why back to school is a great time to get back into a schedule and think about the things we’ve neglected over the summer. This includes oral hygiene. Coming in for a check-up when school is back in session is a good idea to ensure your children’s oral health is in a good place. It’s also a great time to get children into a schedule that includes routine, daily oral health choices. This means teaching them to brush and floss their teeth each morning before school as well as every night before they go to bed. These simple habits can have positive, long-lasting impacts on your child’s oral hygiene. Also, teaching them about eating foods that strengthen teeth and gums can have a positive impact on their dental hygiene choices. Newman Family Dentistry provides dental services for the whole family. We provide an environment where children, teens, and adults can feel comfortable and listened to. Please give us a call to schedule an appointment. 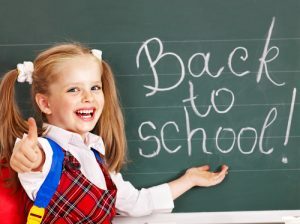 Back to school is a great time to bring your children in for a check-up. Our friendly front desk staff are happy to help and answer any questions you might have.